Kyle Brown leads the Spartans past Temple City. 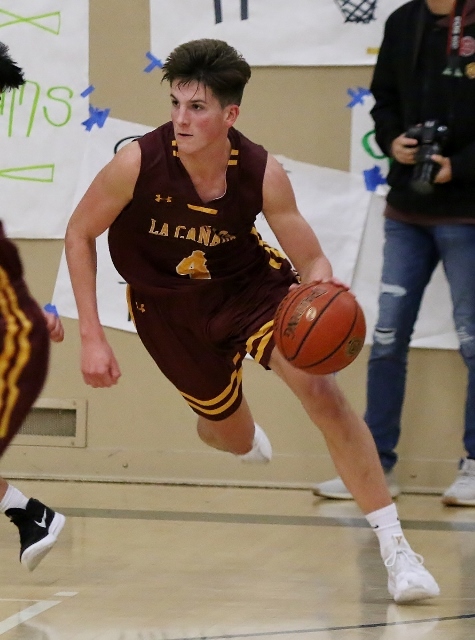 (Temple City) – Kyle Brown scored 22 points and Ryan Graves added 17 to lead La Canada to a 66-51 win at Temple City Friday night in Rio Hondo League action. The Spartans led 36-24 at halftime and extended it to 14 by the end of three before putting it away in the fourth. Temple City cut the lead to 10 in the final period but that was as close as the Rams could get. La Canada had two other players in double figures as well as Zach Feehan and Ryan Grande had 13 and 10 respectively. The Rams tried to stay in the game as they fired away from three but after falling behind by double digits in the second quarter they weren’t able to climb out of the hole. Brandon Torimaru led Temple City with 22 points and Nathan Kuoch tossed in 11. Elton Lo had 9 and Eric Khaw contributed 7 points. The Spartans stayed perfect in the Rio Hondo with the victory improving to 5-0 in league and 18-5 overall. The Rams fell one game behind LC in the Rio at 4-1, 14-8 on the season. Next up for La Canada is a home game against Monrovia Tuesday night while the Rams travel to Blair.